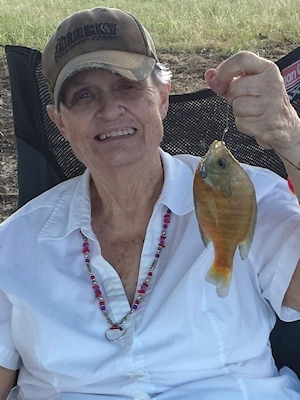 Obituary – Moser, Shirley Joann (Love) « Perry High School Alumni Association, Inc.
Shirley Joann (Love) Moser, age 82, was born July 6, 1932 in Kilgore, TX the daughter of John C. Love and Ethel T. (Tims) Love and had lived in Hugo since 1964. 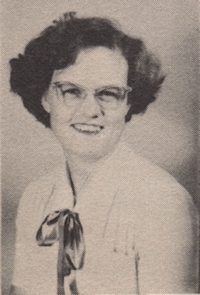 She married Casey Moser on June 11, 1950. He preceded her in death. She was also preceded in death by her parents and two grandsons, Shawn Bell and Kyle Bacon. Shirley was owner and manager of the Hugo Credit Bureau for over 30 years. In her retirement, she loved being a guide at the Hugo Frisco Museum and could give facts and history of it and Hugo that few people knew. She was an avid crafter with a specialty in crochet. Shirley was also an avid animal lover. She dearly loved singer Ty England and all types of country music. In tribute of Shirley, we all plan to wear her favorite color, purple at the memorial service. SURVIVORS INCLUDE: three daughters, Nikki Bell and husband, David of Antlers, OK; Nancy S. Love and husband, Kelly of Boswell, OK and Carol Middleton and husband, Peyton of Conroe, TX; two foster sons, Gary Bacon of Mountain Home, AR and Richard Watson and wife, Esther of Lone Grove, OK; one sister, Nancy Gurley of Arvada, CO; fifteen grandchildren, Jennifer Warren, Kevin Moon, William Bell, Joseph Bell, Jessica Harless, Gayla Parsons, Randilee Parsons, Kassie Parsons, Jessica Testerman, Jacob Love, Rebecca Woods, Jay Middleton, Boyd Middleton, Verranda Taylor, and Ricky Watson; 25 great grandchildren; three great great grandchildren; many nieces, nephews, and cousins along with many other relatives and friends. VISITATION: the family will receive friends from 6:00-8:00 P.M., Tuesday, June 30, 2015 at the funeral home. MEMORIAL SERVICES: Riverside Unity Church ~ Boswell, OK on July 1, 2015 at 2:00 P.M. Bro. Tim Harless will officiate.